A recent news story regarding affordable housing in New York may be of interest to readers of our blog. New York City’s Department of Housing Preservation and Development (HPD) approved a separate entrance in a proposed new building containing affordable housing units. The building would therefore have two entrances (it is located on a corner lot), one for the luxury units, and one for low-income units that would comprise 55 of the 219 proposed units. 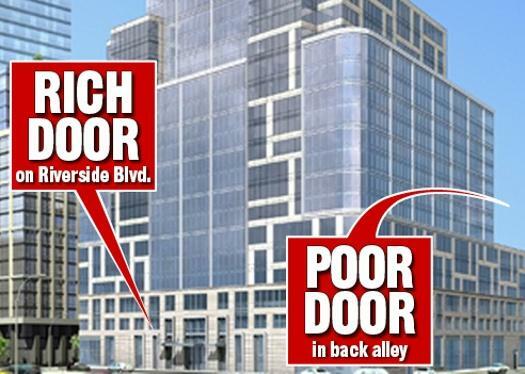 Of course, many people are outraged by this “poor door,” arguing that it imposes a stigma on the low-income renters in the building. Others may argue that separate entrances should be allowed as the price for the builder to include these low-income units, which may not have otherwise been part of the proposed project. Including these low-income units in the project allows the builder to construct an edifice larger than that which would have been allowed if the building only contained luxury units. It also entitles the developer to certain tax breaks for providing “affordable housing” to the residents of New York City. The issue of whether all residents of communal housing, such as an apartment building, are entitled to share in all of the building’s amenities can create additional legal challenges. A building in the Chelsea neighborhood of Manhattan has an indoor swimming pool, a rare sight in Manhattan. There are several buildings with access to the pool, known as London Terrance Towers and London Terrace Gardens. However, these buildings contain co-op apartments, which are owner-occupied, as well as rent-stabilized units, which are not. Under an expiring agreement, between the landlord of the Gardens buildings and the cooperative corporation, the renters were allowed to use the pool. As the agreement is expiring, there is now an issue of whether the rent-stabilized tenants’ access to the pool can now be legally denied. This is a similar, although not identical issue, to the “poor door” issue discussed above. The difference is that all rent stabilized tenants have their rent regulated by the New York State Department of Homes and Community Renewal (DHCR). Losing access to any services in the building to which a tenant previously had access to may entitle such tenant to a legal rent abatement. For example, if a rent stabilized apartment includes access to a roof deck, health club, laundry room, and recreation room located in the building complex, and such access is eliminated or curtailed, the tenant may be entitled to a legal rent reduction upon appeal to the DHCR. Longtime readers of this blog may have also read prior posts relating to attempts to encourage the construction of affordable housing in Westchester County. Although all of us would like to pay less for our housing, attempts by the government to influence the supply and demand of the housing market have meet with mixed results, at best. Legally, Westchester County has been involved in a lengthy and contentious lawsuit regarding its promotion of the construction of affordable housing within the County. Whether Westchester County is in compliance with the Court’s Orders in this case is still a subject of continuing strife and litigation. Our firm has experience in DHCR appeals related to reductions in building services as well as issues relating to affordable housing in both New York City and Westchester County. Any reduction in services provided by the landlord may be grounds for a rent reduction in a rent stabilized unit. Although the DHCR may not be able to restore such services, the tenant is entitled to compensation in the form of a rent reduction. We welcome all inquiries regarding reduction of service and rent issues, as well as any issues relating to affordable housing units.